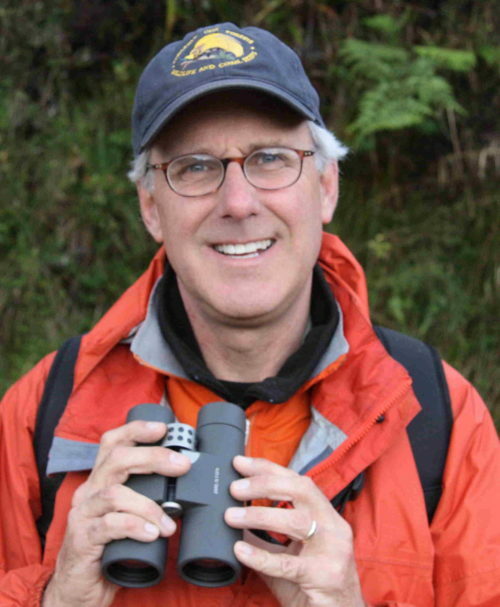 Dr. Bruce Beehler is an ornithologist and Research Associate in the Bird Division of the Smithsonian Institution’s National Museum of Natural History. He completed his undergraduate studies in American Civilization at Williams College and received his Masters and PhD degrees in Biology from Princeton University where he studied behavioral ecology of the birds of paradise. Afterwards, Bruce worked for ten years at the Smithsonian’s Natural Museum of Natural history. Before returning to the Museum in 2014, Bruce worked for Conservation International, the Wildlife Conservation Society, the U.S. Department of State, Counterpart International, and the National Fish and Wildlife Foundation. Bruce is a Fellow of the American Ornithologists Union, and he is the author of eleven books including a field guide and a taxonomic checklist of Birds of New Guinea and the recently released book North on the Wing. In our interview, Bruce shared some of his fantastic stories about life and science. Bruce spends much of his free time outside and immersed in nature. He enjoys playing tennis, going for hikes, and kayaking, as well as watching wildlife at the feeders outside his home. Writing scientific books is a big part of Bruce’s current work. He and two colleagues have begun planning for a comprehensive synthesis of all the available data for a particular mountain in New Guinea. This rich dataset on one location will serve as a benchmark for future research studies. In terms of field work, Bruce is now solely focused on the birds of the boreal conifer forests of the U.S. and Canada. He is interested in understanding how the permanent resident birds survive in these forests year round. Birds sparked Bruce’s scientific curiosity back in 1958 when he was eight years old. While picnicking with his mom and brother at Lake Roland in Baltimore, Bruce spotted the first male red-bellied woodpecker he had ever seen. The bird was beautiful, and at that moment, he became fascinated by birds and woodpeckers. He took out the book Life Histories of North American Woodpeckers by Arthur Cleveland Bent from his local library so many times they had to hide it away in the reserves. During his senior year of college, he was awarded a Watson Fellowship that allowed him to study abroad in New Guinea to research the birds there and train in field biology. After this transformative experience, Bruce applied to graduate school and pursued his PhD in biology. During his PhD, Bruce believed that becoming a professor at a research university was the ultimate goal he should work towards. He quickly discovered upon graduating that these jobs were scarce. Bruce applied for various positions, and he ended up accepting a job as an assistant at a museum. This afforded Bruce an opportunity to work on a broader array of projects, and he researched birds full time for ten years there. The job was wonderful, but he had to make a move to advance his career and become an independent researcher. Bruce continued to apply for jobs at universities and museums, and each time he had to come home and tell his wife that he didn’t get the job. This was really tough, and Bruce was frustrated that he couldn’t make this critical career jump. He was finally offered a job at a conservation organization. Though this wasn’t exactly what he wanted to do, Bruce took the job. For 30 years, he did nature conservation work and conducted limited research on the side. Looking back, this winding career path was the best path he could have taken. His career allowed him to train in a variety of different fields and took him to 35 different countries. It was important to Bruce over the years that he never gave up on doing science. Back in 1977, Bruce and his colleagues began discussing a trip to the remote Foja Mountains of New Guinea to conduct field research on the birds there and potentially document the presence of two lost bird species. There had been a 50 year race to discover where in New Guinea these birds came from ever since poorly documented specimens arrived in England, intended for use in women’s hats. Bruce’s colleague found one of the birds in the Foja Mountains in 1982, but the other remained a mystery. Many years later in 2005, Bruce finally departed for his epic adventure. Very few people have ever set foot on this virtually inaccessible and wholly untamed area. Bruce’s team was dropped off by helicopter in a bog amidst a thick blanket of fog, and they had to cut their own trails through the wilderness as they hiked up the mountains. On this expedition, they not only photographed and studied this second lost bird, but they also discovered over 100 new species of plants and animals. On another New Guinea expedition, two of Bruce’s students arrived early to set up and begin banding birds. After a full day of banding birds, they both reported that their lips went numb after touching them with their hands. The two students compared notes to see what they touched throughout the day. They came to the conclusion that it must have been a family of hooded pitohui birds. The next day, the students sought out this particular bird again and licked it. Immediately their tongue and lips tingled and went numb. When Bruce arrived, they informed him of their findings, and Bruce immediately contacted their funding agency to let them know they would be shifting the focus of the project to study the first chemically defended bird ever documented. Reality is Not What it Seems: The Journey to Quantum Gravity by Carlo Rovelli, Life Histories of North American Woodpeckers by Arthur Cleveland Bent, North on the Wing: Travels with the Songbird Migration of Spring by Bruce Beehler. Bruce has enjoyed traveling across the globe and collaborating with many people from different countries for his work. Every new country he has visited has been a revelation and a pleasure. On one memorable occasion, Bruce and his colleagues were essentially put on house arrest by the Indonesian police in Western New Guinea. There is a giant copper and gold mine on the side of the highest mountain in New Guinea, and the mine is owned by a U.S. company. The company built a road from sea level at the coast all the way up to the mine on the mountain at 14,500 feet. Bruce’s team was interested in this road because it provided a great transect where they could study the rainforest and birds at different elevation levels. The company agreed to let them use the road, but the Indonesian authorities found Bruce’s team’s activities suspicious and didn’t want them wandering around. The authorities forbade Bruce’s group from traveling on the road and limited their birdwatching to the barbed wire fenced city at 7,500 feet that resembled a prison camp. It was frustrating to be stuck there for seven days, unable to conduct their planned research. On one trip to the Foja Mountains in New Guinea, Bruce was traveling with a colleague named Chris who was an expert on mammals. The helicopter pilot dropping them off wouldn’t land in the bog due to concerns about quicksand, so Bruce and Chris jumped out of the helicopter into the unknown terrain below. Within 10 minutes, Chris observed a new species of bird, and Bruce found the skull of a new species of giant rat. It was ironic that the mammologist found a new species of bird while the ornithologist discovered the new species of mammal. In terms of traditions, Bruce’s graduate school cohort used to have double-blind beer tasting parties. Each attendee would bring their favorite and least favorite beer. All beers would be placed in numbered cups, and guests would cast their votes for the best and worst beers. Invariably, some cheap beer would end up rated highly while fancy, expensive beers would find their way to the bottom of the list. These parties were both fun and humbling. Work on what you love, and pursue what you love. Look outside, and take the time to appreciate the little things. The little things in life can give you strength and joy, and they can help you keep moving forward in your life. Bruce’s research career has mainly focused on the interactions between birds and forests. His doctoral work highlighted the specialized fruit-eating habits of the birds of paradise and their impact on seed dispersal and the regeneration of rainforests. This was followed by two decades of work documenting the biodiversity of the great island of New Guinea. In all, Bruce traveled to New Guinea more than 70 times, and he conducted thirty field expeditions on the island. When he was not doing research, his time was occupied with fostering conservation of rainforests and coral reefs in the Southwest Pacific. Today, Bruce has turned his focus to the natural history of North America, and he is particularly interested in the boreal forests of the Great North Woods and the continent’s great migratory systems. Bruce lives with his wife Carol in Bethesda, Maryland. Outside of work, Bruce loves to play tennis, bicycle, hike, and camp. When Bruce is not out in the woods, he is usually at his desk working on a book. Writing is the love of his working life.